It is very hard not to love Penny Dreadful as she hurtles from one disaster to the next: providing ‘hair cuts’ with Dad’s electric razor, rescuing a possibly abandoned dog, and giving the school inspector a locust-filled day to remember! Our little narrator chats away unstoppably and is so utterly believable, it’s as if Penny has completely taken over her creator - Joanna Nadin. Which is exactly as it should be, in this fast-paced world of fiasco and fun. The book is peopled with delightful, quirky, characters that slip in and out of the story effortlessly – and the narrative is only broken up by the gorgeous and perfectly matched illustrations provided by Jess Mikhail. Penny Dreadful is a Magnet for Disaster absolutely deserved to be shortlisted for the Roald Dahl Funny Prize this year – and I only have one complaint to make: I can’t keep up with antics of either Penny or Nadin! 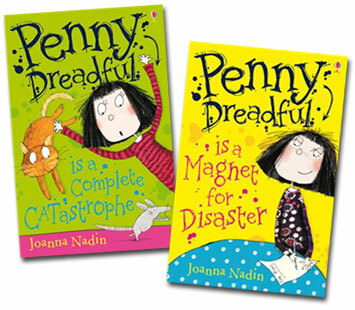 To my shame, I didn’t realise that Usborne have already published the second book in the series (Penny Dreadful is a Complete Catastrophe), and a third and fourth book are lined up for 2012! But it doesn’t surprise me. This character could just keep going – she’s so full of energy and mischief – and Nadin brings her to life with fluency and ease. This is a wonderful book for children and child-like adults; particularly those with a slightly silly sense of humour, a love of chaos, and an aptitude to giggle in a group. I’d recommend it to all my favourite people – both large and small. These sound just right for lots of young readers - and good to have a funny girl too!